This week, we have Olugbemisola Rhuday Perkovich. Olugbemisola is the daughter of a Jamaican mother and Nigerian father, and married to a man of Croatian descent. So, that’s what’s up with the name. She’s worked as a freelance writer and contributing editor at various magazines, and has developed educational materials geared to educators and students. Olugbemisola has worked extensively in youth development, at community organizations and New York City schools. She was twice awarded a public service fellowship by the Echoing Green foundation to work on a creative arts and literacy project with adolescent girls. She received her M.A. in Educational Communication and Technology, with a concentration in Adolescent Literacy and English Education, her B.Sc. from Cornell University, and is a member of the Society of Children’s Book Writers and Illustrators. “I spent a number of my younger years in different communities across the globe. I attended public, private,’international’, and religious schools. These experiences have had lasting benefits as I was exposed to many languages, traditions, customs – new and thrilling worlds. And each move brought with it both an opportunity and a struggle surrounding identity, which is a recurring theme in my work.” She lives in Brooklyn, New York. 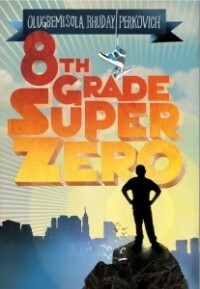 Here’s a little bit about EIGHTH GRADE SUPERZERO, Arthur A. Levine Books. Reginald Garvey McKnight created a superhero character in kindergarten; now he dreams of being a real-life leading man: The Guy who’s got game and gets The Girl. Instead, he threw up on the first day of school. In front of everyone. Seventh grade has gone downhill ever since. Reginald Garvey McKnight created a superhero character in kindergarten; now he dreams of being a real-life leading man: The Guy who’s got game and gets The Girl. Instead, he threw up on the first day of school. In front of everyone. Seventh grade has gone downhill ever since. In SEVENTH GRADE SUPERZERO, Reggie’s faith at all levels is challenged by his friendships, his work at a homeless shelter, and a pair of “Dora The Explorer” shoes. His involvement in a school election leads him to the superhero within, and he learns that sometimes winning big means living small. I jumped up and down, cried, laughed, and called people. Repeatedly. I continue to have random jump up and down moments…wait, here I go! I only sent my manuscript to one editor, the one who ended up acquiring it. It took a while from query to offer, as I was in the ‘slush pile’ — I am still amazed that I made it out of one of those mountains of manuscripts! — but I was certain that these were people that I wanted to work with. I queried agents rather slowly, as I spent a lot of time researching them, their preferences, reading their clients’ work, etc. I waited a long time to meet the person who ended up becoming my agent, because she only takes queries based on referral or conference meetups, and it was definitely worth the wait. Sometimes I felt like I was so much slower or less aggressive than other authors seeking representation, but it was important to me to pursue relationships that felt “right”. And things feel very right! I got a rejection from an agent that was simultaneously very insulting and really complimentary. It was pretty impressive, the way the agent made me feel such extreme highs and lows in a matter of minutes. Meeting expectations. Continuing to improve, to hone my craft. The paralyzing effects of fear and perfectionism. In struggling with SEVENTH GRADE SUPERZERO, I realised at one point that I was thinking more about myself and how I wanted to be perceived as a writer than about my character and his story. I really had to get over myself and “serve the work”, as one of my writing teachers used to say. Anne Lamott, Bird By Bird; Madeleine L’Engle, The Rock That is Higher: Story as Truth; Stephen King On Writing; Uta Hagen, Respect for Acting; Orson Scott Card, Characters and Viewpoint. Finally, Snoop wants to know: Would you like something sweet to eat? YES. This concludes our interview with our latest author Olugbemisola Rhuday Perkovich. We wish her much success with her debut novel EIGHTH GRADE SUPERZERO. 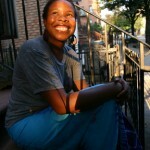 To see what Olugbemisola is up to these days, visit her blog at http://olugbemisola.livejournal.com or her website at http://www.olugbemisola.com.